Western blot analysis of extracts from MCF7 cells, untreated (-) or λ phosphatase-treated (+), using Phospho-Akt1 (Ser129) (D4P7F) Rabbit mAb (upper) and Akt1 (C73H10) Rabbit mAb #2938 (lower). 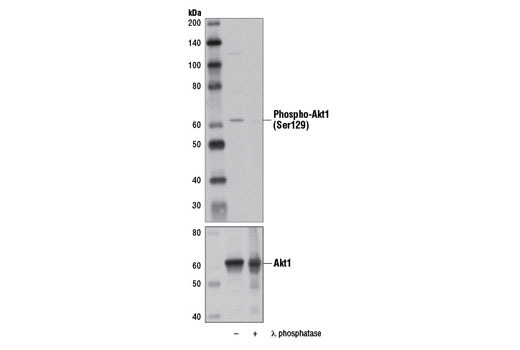 Phospho-Akt1 (Ser129) (D4P7F) Rabbit mAb recognizes endogenous levels of Akt1 protein only when phosphorylated at Ser129. Monoclonal antibody is produced by immunizing animals with a synthetic phosphopeptide corresponding to residues surrounding Ser129 of human Akt1 protein. Research studies indicate that protein kinase CK2 phosphorylates Akt1 at Ser129 (20), which promotes association of Akt1 with the HSP90 chaperone and enhances Akt1 kinase activity by inhibiting dephosphorylation of Akt1 at Thr308 (21). CK2 phosphorylation of Akt1 at Ser129 can also enhance β-catenin transcriptional activity as well as cancer cell survival (22,23). Di Maira, G. et al. (2005) Cell Death Differ 12, 668-77. Di Maira, G. et al. (2009) Cell Mol Life Sci 66, 3363-73. Ponce, D.P. et al. (2011) J Cell Physiol 226, 1953-9. Ponce, D.P. et al. (2011) Mol Cell Biochem 356, 127-32.